While it might be a common occurrence for other food bloggers, it’s not usual for me to receive invitations to, well, anything. So when the folks at Campos asked me if I’d like to come check out The Cupping Room above their flagship store in Newtown, it’d be an understatement to say I was excited, especially since it had been on my to-do list since forever. When I arrive at 5 to 3 on a Saturday, it’s hot and crowded and I can’t move for the customers. I’m not surprised, it’s one of the reasons I don’t come here that often, but when my partner in crime arrives, she’s shocked. ‘It’s as if there aren’t any other coffee shops in Newtown,’ she marvels. Well, for some, that may be true. We elect to wait outside. 10 or so minutes later we’re led through the crowd to the back of the store, up the steep stairs lit by a single dangling light bulb. Like an old-time speakeasy, a panel in the door slides open and a pair of eyes peer out. ‘Two?’ Asks a voice. We nod. We enter. The space is pitch black save for a long wooden table, stainless-steel edged and lit by a line of spotlights. Our host, Todd has laid out 6 small bowls of coarsely ground coffee for each of us to ‘cup’ or taste. Cupping, he explains, is standard practice for roasters all over the world. 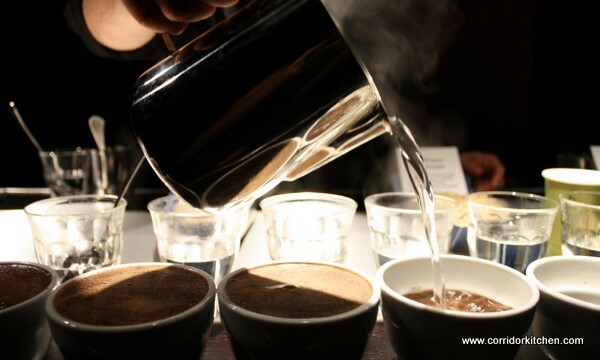 The idea of cupping is that because you’re removing all the variables inherent in brewing coffee, you’re leveling the playing field and you really are just tasting the coffee. 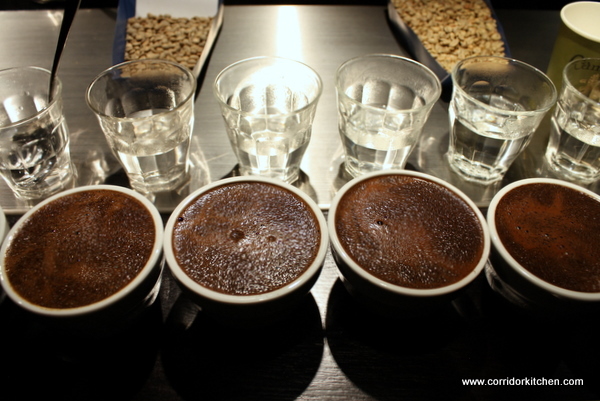 Each step of the cupping is usually given a score and that’s how a coffee is chosen by buyers. Latte glasses of water and metal spoon glint in the light as Todd explains the process. The first step, he says, is smelling each grind. We inhale each cup (well, not literally, but you know what I mean) and leave the descriptions to the expert. Next, Todd lets the coffee steep in 93° water for 7 to 15 minutes. We then break the ‘crust’ of grounds that has formed on the top, careful to expose rather than destroy the crema. Once we’ve ‘crusted’ each cup we are to taste each one in turn without speaking – this is the time to form our initial impression. Each coffee must be taken with a single, sharp sip from our spoon. Todd makes a loud definitive ‘slurp’ with his, practically inhaling the brew but we’re more timid. Afterwards we take our time though the 6 grinds, which have been set up in a very deliberate order, and we discuss the flavour profiles of each one. Todd says there’s no wrong answer here and encourages us to describe the coffees. I find this very difficult to do, but as soon as he mentions a flavour, for example ‘citrus’ or ‘earthy’, I find his description fits what I’m tasting, and it’s more than just the power of suggestion. Indonesian Toarco Jaya – a solid, well rounded base. The Ethiopian Lekempti – fruity, lemony. Yum! Panama Emporium – I’m not sure how to explain this, but I don’t like it. It reminds me of that nauseous feeling of having had 5 or 6 coffees. Colombian el tiestro –I liked it but I don’t remember much else about it. Kenya Gethumbbwini – Very strong and zesty, like lemon peel. Supermarket coffee – tastes like nothing. Campos cups a variety of beans every day in their warehouse to maintain the consistency of their signature blend, ‘Superior’. They will roast on a Monday, cup in a Tuesday and adjust the ratios accordingly on a Wednesday, and this cycle continues each day. Visiting coffee plantations and tasting their crops has been recreated in a much more pristine and theatrical setting here at the cupping room. I ask what coffee producers would think of their gleaming setup and he admits they’d probably find it pretty bizarre. Think I’d be much like you where I tend to recognise flavours in coffee/wine, and identify them as familiar, but am not able to describe exactly what they are. Looks like a great educational experience though! Such an interesting post! I didn’t even know about this place!!! Would love to try it too! Looks amazing – I wish I went! Definitely going to book a session there so I can more freely push my learned opinions about coffee onto others!! What an interesting experience. I guess the first time must be similar to a first ever wine tasting. Oooh! It looks so exciting. I love places that create their own ritual around their product. I’m constantly having to taste wine for work, and I’m exactly the same, it’s difficult for me to put my finger on the flavours I’m tasting, but my more experienced colleagues have no difficulty. ‘Kerosene, in a good way’, ‘Grape Hubba Bubba’…YES, that’s exactly what I was going to say! Similarly, we taste all wines at room temperature so we can gauge the full flavour – it’s incredible how much flavour you lose off chilled wine. @ Mademoiselle delicieuse – It was, and a lot of fun too! @ Manu – It’s worth a look for sure. @ Senhor R – But I invited you! @ Phuoc’n Delicious – It did taste like nothing! And you’re right, it’s a lot like wine tasting. @ Gaby – It was similar, but for me, waaayyy more enjoyable. @ Jill – I agree, the conditions for tasting are super important. I loved the description of the entry to the cupping room.